On a recent flight to the US I sat next to the IT director for a global corporation. He asked me why I was travelling, to which I answered that I was giving the keynote presentation at an IPv6 conference held by the US Federal government. Without hesitation, his response was “IPv6 is not even on my radar”. This set me thinking about blockers to IPv6 adoption and how we can address them. First, I spoke about this at the UK IPv6 Council’s annual meeting in December 2017 (slides, video). More recently I have expanded upon this important topic in two posts; one on the APNIC blog and one, to mark the World IPv6 Day anniversary, on the RIPE Labs blog. After over twently years of working with IPv6 we have reached the point where not only is IPv6 mature, widely implemented and deployed, but also where the gradual deterioration in the legacy IPv4 Internet is becoming a driver for adopting IPv6. What remains is to demonstrate that the blockers to IPv6 adoption are not as significant as some believe. Take a look at my post and let me know what you think. 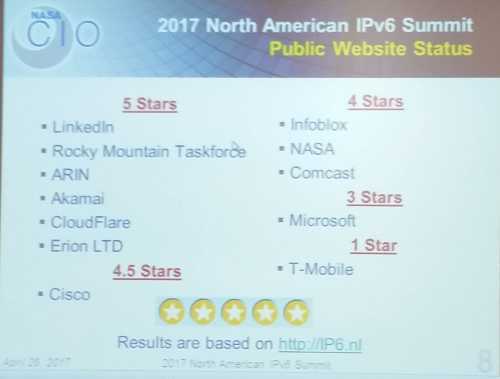 Earlier this year I was privileged to speak at the North American IPv6 Task Force (NAv6TF) 2017 conference held at LinkedIn’s offices in Sunnyvale California.The NAv6TF has a long history of promoting IPv6 adoption in North America and further afield. Many well-known IPv6 names are actively involved in NAv6TF. This year, I joined a truly excellent set of speakers from organisations such as LinkedIn, Cloudflare, Akamai, Cisco, Microsoft, NASA, ARIN, Comcast, Infoblox and T-Mobile. My presentation described the effects that the increasing deployment of Carrier Grade NAT (CGN) is having on the legacy IPv4 Internet. CGN is causing problems for all parties from application developers, content providers, service providers, law-enforcement through to end-users. 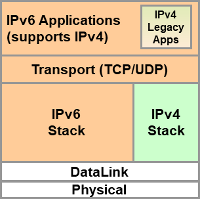 These non-trivial problems can all be mitigated or resolved through the deployment of IPv6. As a result, CGN and the degradation of the IPv4 Internet are acting as drivers for the adoption of IPv6. You can watch a video of the session below or view the slides here. At the conference, Kevin L. Jones from presented a very interesting talk on the status of IPv6 in NASA and the Federal government. I was delighted that he had taken the time to measure the IPv6 status of each of the organisations represented by speakers at the conference. Erion got five out of five stars! The UK IPv6 Council is running a one-day workshop on IPv6 Security in July. Erion’s David Holder is to present a session entitled “IPv6 Security Fundamentals”.